To make an appointment call us on 9404 1177 or book online. 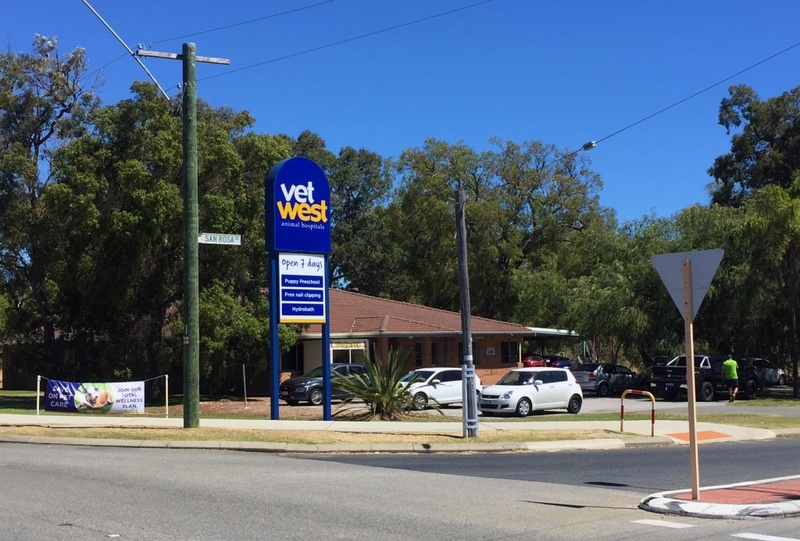 Vetwest Wanneroo is located at 5 San Rosa Road on the corner of Wanneroo Road, Wanneroo 6065. Situated only a 1 minute drive south of Wanneroo Central Shopping Centre, fresh bones or vegetable treats for your pet after a visit to our clinic is easy which our pet will love! The City of Wanneroo has an active and warm community spirit that Vetwest is proud to be a part of and Wanneroo is surrounded by beautiful national parks, walking trails, lakes and green parks. We are proud to service the entire North-East area of Perth around Wanneroo including the suburbs of Wangara, Pearsall, Gnagara, Woodvale and Sinagra and Jandabup. For your convenience, our opening hours for Monday to Friday are 7:30am to 7pm, perfect for before or after work appointments. We are also open from 8am until 5pm on Saturdays and Sundays, allowing you more opportunity to book in an appointment time that works for your schedule. If you are ever concerned about the health of your pet please do not hesitate to contact us, not matter how big or small your question may seem. Our vet hospital has cutting edge capabilities, ensuring that we have the best facilities and pet accommodation in the area. Our team warmly treat your pets like their family and we know we are able to exceed the expectations for high class animal care and treatment. With our state of the art clinic, we offer a wide range of services for your furry, feathered or scaled loved one and the highest standard of care available. Our fully equipped hospital can handle all types of appointments, from dental treatment, annual health exams and vaccinations, to routine surgery and emergency treatments. At Vetwest Wanneroo we offer our renowned weight loss clinic for pets, part of the free service by appointment that we offer with our fantastic veterinary nurses. Included in this is also our popular free nail clipping and nurse advice service. Just call us up to make an appointment and bring your dog or cat in to have their nails tended to in a soothing environment. If you have a new puppy or kitten in your family, our nurses will also chat with you in an appointment to explain how you can best look after your new addition. Our qualified veterinarians keep up to date with the latest information so that your pet receives the best treatment and we run regular competency trainings for our entire team to ensure an ongoing high level of knowledge and skills to better service your pet’s needs. Our vet nurses are not only highly qualified but extremely warm and friendly so you can relax knowing that your loved pet is in the best care possible. Vetwest Animal Hospitals have been in Perth for over 20 years, and we are focused on providing the highest level of compassionate care for your pet and impeccable customer service to you. Our veterinarians are passionate, highly skilled and completely invested in providing the highest standard of service to our family of human and animal clients and most importantly - we love what we do! Be sure to call Vetwest Wanneroo today to schedule your next appointment – we look forward to meeting you and your pet!